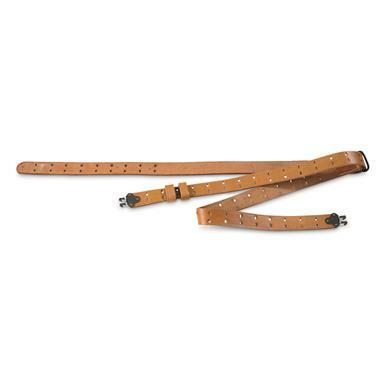 Attach this reproduction U.S. Military Surplus Leather M1 Garand Sling and make steadying your gun during target practice a much easier proposition. Made from buffalo leather, it ensures proper tension when wrapped around the arm during sessions at the range. It measures 48"l. and 1.25"w. and will fit most 1.25" sling swivels. It'll also complete the look of your M1.